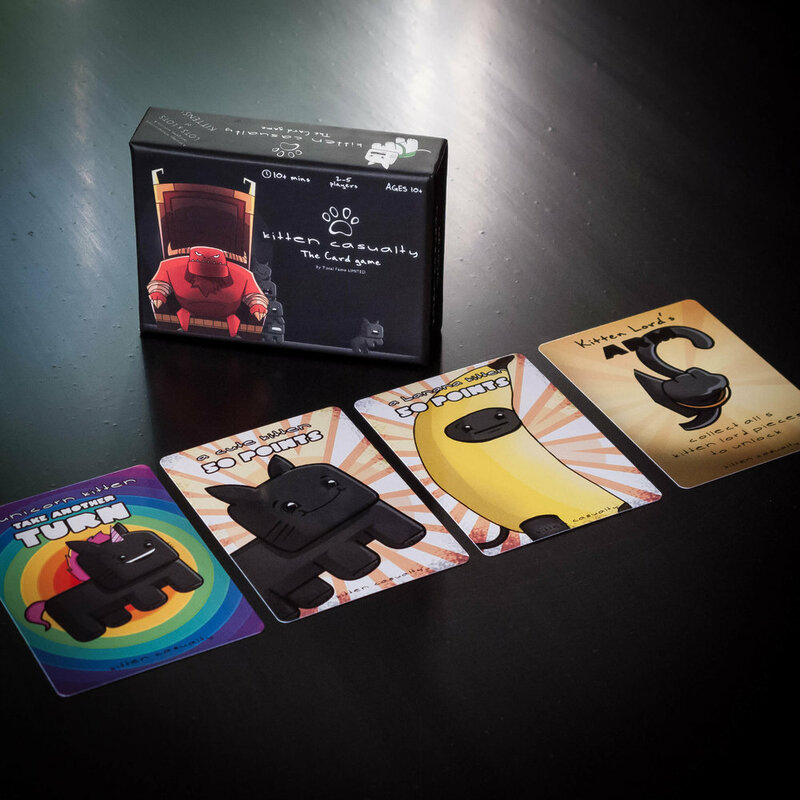 Card games that feature kittens fighting, exploding, imploding, or ending up in blenders seems to be the thing lately - no doubt fueled by the $8 million take of Exploding Kittens on Kickstarter. Since then, no juvenile felines are safe in crowdfunded games. The latest iteration I've seen comes from Total Fame Limited, who kindly sent me a copy of their (literally) small card game Kitten Casualty. A publisher sending me a game to review is an OGA first. Honestly, I didn't know how to approach this. Like I've said before, I don't intend OGA to be a review site, but how can you talk about games, without, well, really talking about games? I decided to review Kitten Casualty because I haven't done this kind of review before, there are few reviews on Kitten Casualty online, and TFL was successful in their first campaign. The first impressions of Kitten Casualty is great; this is a nice little package. The cards aren't in a cheap tuck box, but a super-sturdy telescoping box, with construction I associate with high-end game manufacturing. It's small and fits easily in a jacket pocket, reminding me of those small games from Oink. I wish more card games were packaged like this. The small box size does mean the print is small and the typeface a little tricky to read (more on the typeface later), but it's not a big deal. The cards are great, with a good thickness and a super glossy finish that allows the full-color printing to really pop. I'm wondering if the quality may have been a stretch goal from the Kickstarter campaign, as I rarely see card games have this feel. Kitten Casualty is a light "take-that" elimination game; a player wins by being the last person standing after everyone else has been knocked out. The primary way to eliminate a player is by acquiring 500 points worth of Kitten cards (most Kitten cards are worth 50 points.) After that, you may claim the Overlord card which allows you to choose someone to kick out of the game. Another way is to collect the set of all five Kitten Lord cards, which also triggers an elimination. The game starts with five cards to each player, with a draw deck and discard pile in the middle of the table. On their turn, a player draws one card and may play up to three cards in front of them, which can be any combination of cards: Kitten cards, Kitten Lord cards, and/or Action cards. The Action cards are the "take-that" part of Kitten Casualty: usually bad news for your opponents. For example, there are Actions that let you steal other players' tabled cards, take another turn, "kill" another Kitten card, or even skip the next player's turn. Play continues until someone gets 500 points, then they place their kittens in the discard pile and choose someone to lose, unless the victim holds the "Revive" action card... which keeps them in the game, and a bummer for whomever tried to knock them out. The game supports two to five players, with a recommendation to take out a few kitten cards and the skip cards when playing with two. Honestly, I'd probably take out the skip cards anyway as skip a turn is my least favorite card game trope. My experience with elimination games is that a dominant strategy emerges called "thwart the player who is winning." Once the leader is neutralized, another will emerge to beat up on, making a game longer than it should be. This my issue with Munchkin, and, to some degree, Fluxx. I'm also wary of games with player elimination if they last longer than 5-10 minutes. Kitten Casualty seems to hit the 10-15 minute mark pretty well, so if someone gets ousted early, it won't be too long before they are back to play again; it doesn't wear out its welcome like other elimination games. Kitten Casualty has a few design issues, at least in this printing. One is the included folded rules sheet: not all the rules are on it. For example, it doesn't tell you exactly how many cards to play on a turn. I eventually found that information on a players' aid card when I glanced through the deck. Not a huge deal as the rules are simple enough, but it would have been nice to have them all on one sheet. Another quibble is the choice of typeface. The main body text of Action cards are in a handwritten-style script that can be difficult to read. Once you are familiar with the names and art of the Action cards, then it won't be much of an issue, but expect some squinting at cards for the first few plays. TFL is launching a "remastered" version on Kickstarter in a week or so, and, from what I've seen so far, the readability issue seems to have been addressed. This is a totally subjective thing, but the cartoon kittens are a little unnerving to me with their flat human-like facial expressions, but, the art is consistent in style, and I give credit for that. Despite the "cute" kittens, there is some cartoony blood on a few of the cards, so I wouldn't say it's a kids' game; it's fine for pre-teens. Overall, Kitten Casualty is a sweet little filler in a great package. I can see people really enjoying this game. If you think you might be one of those people, I recommend checking out the new remastered edition coming to Kickstarter on May 30th.